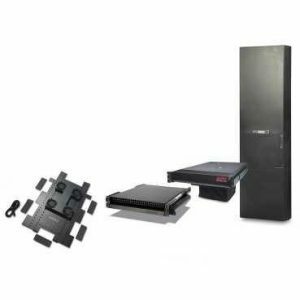 APC Rack Air Distribution by Schneider Electric offers rapidly deployable solutions to quickly address hot spots in existing IT environments. These distribution systems are suited for power dense racks and low pressure areas. They are rack-based cooling products that are specifically integrated in, or on, individual rack enclosures to solve inadequate air distribution problems. Rack Air Distribution systems work with existing cooling products to either provide cool air to or remove heat from the rack enclosure. These hot spot problem solvers ensure uniform inlet temperatures to the IT equipment. They provide enhanced air flow and are designed to assist base and supplemental cooling. APC Rack Air Distribution products will assist performance load sharing techniques, improving rate of flow to the target cabinet. The Rack Air Distribution Unit will improve effective cooling by up to 3Kw. Rack air distribution products offer ducted and fan-assisted options to improve cold air distribution and heat removal to and from IT equipment racks. They are very customizable with options for top, bottom or side venting. For more information on configuring the right solution for your cooling needs call us at 800-876-9373. Fan-assisted units help overcome hot spots caused by high-density loads and airflow restrictions due to cabling, piping, and restricted airflow paths within racks and raised floors. Duct kits direct air within the rack for side airflow equipment, and exhaust ducts direct air to drop ceilings for ducted return systems. Increases Airflow – Provides proper intake temperatures, increasing equipment life.